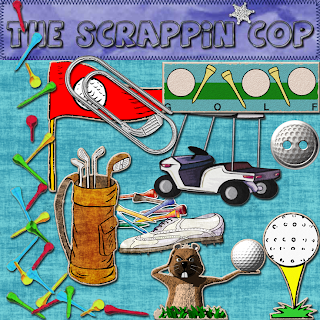 The Scrappin Cop: Golf Element Freebies! Today's freebies are the golf elements! Odds and ends in .png form. There's a tee border that you can place on your page that's kinda cool. And a little button that resembles a golf ball, and a paperclip that resembes a golf club. I just had to throw the gofer in because he cracked me up. Tomorow I should have the patterns done and posted and then I'm moving on to summer fun! Thank you! Your blog post will be advertised on the DigiFree Digital Scrapbooking Freebie search engine today (look for timestamp: 28 Jun [LA 01:25am, NY 03:25am, UK 08:25am, OZ 06:25pm]). Beautiful kit for the adept some golf, thank you. Merci beaucoup, il est très joli. Bye..bye..good day. Oh, thank you! I have a few golfers in my family - including me. These are great! awesome kit - thanks for the freebie - caddie shack was just on this morn and we were talking about the cute gopher. My duaghter has just started golfing and I have benn looking for some unique golfing kits. Thank you so much!! I have been searching for a golf kit for a month now and I love yours!! Thank you for being so generous! Thanks so much for these downloads-they're brilliant! Thanks for the Golf themed elements! I am new to scrapbooking, but have been looking for a couple of golf items for a page I am doing. Again thanks!!! Thanks so much! I'm doing golf albums for my son's high school team and these are fantastic!